The City of Port Phillip draft Urban Design Framework for Port Melbourne Waterfront includes two high rise towers at 1 – 11 Waterfront Place. These would demolish community sports and child minding facilities that were integral to the Mirvac Development. They would magnify existing traffic gridlock and dominate the beachfront, open community space and Heritage Railway station building, blocking gateway views of Melbourne city for both tourists and locals. If you can arrive 10 or 15 minutes before the start, there are question forms that can be filled out and handed to the officers. You then have the opportunity to speak to your questions and have them responded to by Council. The more people who ask questions the better the reaction by councillors. On December 20th 2011 all property owners within Beacon Cove received advice from the City of Port Phillip that Amendment C73 had been gazetted, bringing Beacon Cove under the City of Port Phillip Planning Scheme. Owners within the high rise precinct were further advised that the respective Owners Corporations would replace Mirvac as administrators of covenants and no further action is required on the part of such owners. Owners within the low rise precinct were advised that covenants on title will require amendment to reflect Mirvac's administrative withdrawal from the Estate. Such amendment will require production of Title following further advice from Council. Mirvac, Council and Major Projects Victoria have agreed to fund this process providing their offer is accepted prior to February 29th by completing the form attached to Council's letter. Any questions should be referred to Sara Miletic, Senior Council Planning Officer, on 92096237. The Age published the following article on 15 February. A PLAN to allow a high-rise building at a property owned by a multinational Kuwaiti company has angered Port Melbourne residents who say it would lead to Gold Coast-style development. The property is at the centre of a broader council proposal to rejuvenate the waterfront. Port Phillip Council will seek public feedback for its draft plan to redesign a large section of Port Melbourne. The draft allows for a 14-storey tower near Station Pier. It includes plans for more shops to cater for tourists stepping off cruise ships and traffic changes to ease congestion. Beacon Cove Neighbourhood Association president Eddie Micallef said the government under former premier Jeff Kennett introduced a three-storey height limit for the site. Mr Micallef said 14 storeys was too high and residents were fiercely opposed to the proposal. He said high-rise buildings would block sea views and create a wind tunnel, long shadows and traffic problems. ‘‘It’s a magnificent view and it’s worth keeping,’’ he said. Mr Micallef said the plans also allowed for a 10-storey tower on the site, which would spoil the view for tourists arriving at Port Melbourne. 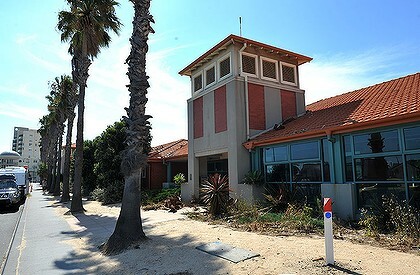 Port Phillip Mayor Rachel Powning said the draft aimed to preserve the area’s maritime history and ‘‘unique character’’. She said the council designed the plan to ensure ‘‘high quality’’ future developments at the site. Albert Park MP Martin Foley, whose electorate covers Port Melbourne, has written to residents outlining his opposition to the proposed high-rise building. He said the site’s height restriction had helped lure some residents to Port Melbourne. Kuwaiti billionaire Sheikh Mubarak Abdulla Al-Mubarak Al-Sabah’s company is believed to have bought the site for $21 million. In 2010 The Age reported that he planned to build a 28-storey tower on the property, but his plans remain unclear. The company is yet to submit an application for the development to the council. The Australian arm of the sheikh’s company, Action Group Australia, operates hotels in Glen Waverley and Brisbane. The company’s website describes the property as one of the ‘‘few remaining development sites’’ in the area. It said the site could be used for a residential or hotel development. The sheikh’s Australian business partner Andrew Nehme could not be reached for comment. A former gym and child care centre sit empty at the site. Residents fear the building could eventually exceed 14 storeys if the sheikh successfully challenges the council’s height restrictions. Helen Kuchel, chairwoman of resident group Port People, said a building at the proposed height would create a ‘‘physical barrier’’ to the beach and foreshore. Port of Melbourne Corporation (PoMC) is once again conducting port boat tours, departing from Boatman’s Landing (Docklands) and Williamstown (Gem Pier) during March. These free tours will include a guided commentary from PoMC staff and offer an excellent opportunity to see the working port up close, visiting major port facilities including Swanson Dock, South Wharf, Victoria Dock and the Yarraville Berths. Each round trip (Docklands-Williamstown and back) will take approximately two hours. Tours will be on Saturdays (10, 17 and 24 March) and Sundays (4 and 25 March) departing Docklands at 9:30am, noon and 2:30pm, and departing Williamstown at 10:45 am and 1:15pm. Please check the PoMC website (as listed below) for more information. We strongly advise people to book via the online booking form on the PoMC website www.portofmelbourne .com/community to ensure that all details required for a booking are included. Bookings are now open. It was very encouraging to see so many residents in Bay Street yesterday talking to our councillors on residents’ views on the draft framework for the waterfront and especially 1-11 Waterfront Place. Some of the councillors see a different picture to when they voted for this draft in December – thanks to you. The next opportunity to have your say in person is at the Council meeting at 6 pm this Tuesday 14 February at South Melbourne Town Hall. If you can arrive 10 or 15 minutes before the start, there are question forms that can be filled out and handed to the officers. You then have the opportunity to speak to your questions and have them responded to by Council. The more people who ask questions the better the reaction by councillors. It REJECTs the proposed substantial TOWER development on 1-11 Waterfront Place. Show your support by clicking on the LIKE hand icon, and either log on to an existing Facebook Account or create one there and then. Here is the direct link to the FACEBOOK PAGE to pass it onto friends and neighbours. Volunteering in our Community - South Port Day Links Inc.
South Port Day Links Inc. is a volunteer based community organization that has been operating in the South and Port Melbourne area for 23 years. It is operated by a volunteer Committee of Management. We currently have five programs operating. The largest is our community transport program. This utilizes volunteer drivers to transport frail elderly people around the local area in cars supplied by the organization. Our other programs are PetLinks, WalkMates, GardenMates and InfoLink. The community transport program operates Monday to Friday and the other programs are more flexible. A police check and reference check is required for all programs. This is undertaken by South Port Day Links Inc. If you are interest in volunteering or know of people who would find the support programs beneficial please contact SPDL Inc.
For more information visit www.spdl.org.au and/or ring the Coordinator of Volunteers on 9646 6362.